Yes, I'm posting another photo from my experience with the thousands of Common Green Darner dragonflies, which are attracted to the hay bales stacked along the road. Hey, I couldn't help myself! I think the photos are cool, even if I wasn't at all successful at capturing the dragonflies in focus. Trust me, when you have thousands of dragonflies in constant motion, it is VERY difficult to capture any of them in focus. Trust me, I tried several times... thank goodness for digital. Otherwise, I would have gone through lots of film. What a Hitchock like feel this has! Excellent photo. The bales are a wonderful subject that are artistic - the dragonflies enhance the hay by flying by the thousands of the harvest. 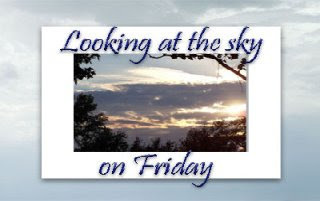 With all sitting underneath a beautiful sky, the lovely summer picture is stunning! I agree... the photo is really cool. I really like these shots, too - focussed dragonflies or not. I like the hay bales and the sky. I was just saying the same thing in my post - thank goodness for digital. I wasn't copying you, really I wasn't! This is an awesome post! 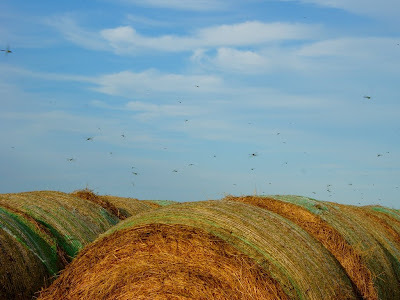 I love the hay bails, and would definitely like to see that many dragonflies at one time. Wow! Isn't digital photography the best invention ever...:) And I agree..our dogs do keep us sane! We see lots of those around these parts! :) Great shot and best of luck to your friend on the new adventures of photography! Thanks (as always) for playing along! Oh my gosh! That's a LOT of dragonflies! Amazing!